Fears of a housing bubble in London are growing as home prices climb to record highs. London house prices have hit record highs, jumping by 10% in a year and earning some lucky homeowners more than their annual pay packets. Official data shows the median gross wage in London last year was £30,471. That compares with a rise of £33,133 in the average price of homes in the U.K. capital over the past 12 months, according to figures released by mortgage lender Nationwide on Friday. That means many Londoners have earned more on paper from the appreciation in the value of their homes than by going to work. Prices in London are now 8% above their 2007 peak before the global financial crisis, which saw property values collapse by about 20% across the U.K. 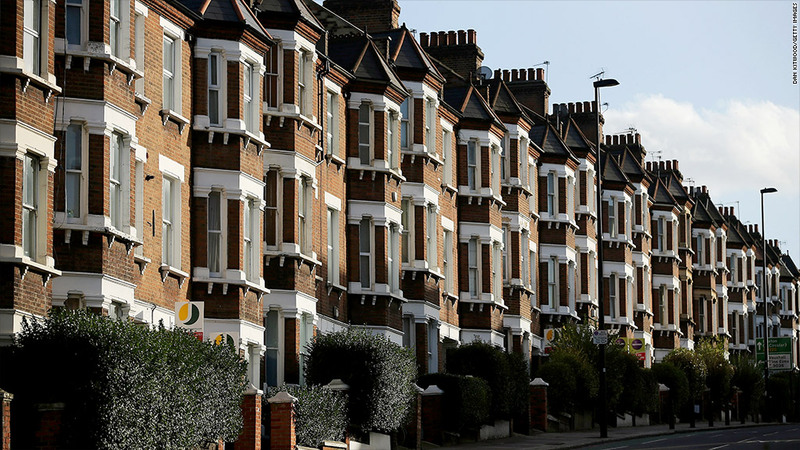 The findings will fuel concerns that the U.K. may be heading for another property bubble, as low interest rates, improving economic sentiment, and aggressive government subsidies push prices higher. And there are now signs that the government may be worried. Chancellor George Osborne has asked the Bank of England to review the "Help to Buy" home subsidy scheme on an annual basis, instead of original plans for a review every three years, a Treasury spokesperson said. Related: British housing boom - or bubble? Help to Buy, which aims to stimulate lending and support the economic recovery, began in April by giving buyers with 5% deposits interest-free loans for five years on newly-built homes. From January, the government is planning to extend the scheme to assist buyers purchasing existing properties worth up to £600,000. The Bank of England will be able to recommend the government lower the scheme's price cap if it feels the need to take some heat out of London prices. Earlier this week, the bank's financial policy committee said it was monitoring "emerging vulnerabilities" in the housing market. But prices across most of Britain are much lower -- and not rising as fast --- as in the capital. Prices across the U.K. now average £170,918, that's up 4.3% over the year. Wealthy investors from overseas are driving London property prices higher as they snap up prime locations, while local residents are also competing for real estate in Europe's financial capital. The Bank of England recently pledged to keep interest rates at record low levels for years to come, which helps homeowners by keeping mortgage rates low. But some experts are worried that once rates start rising and government subsidies expire, homeowners could start defaulting, leaving taxpayers liable for tens of billions of pounds of lending.